Ancient rock quillwort grows in Enchanted Rock’s vernal pools. 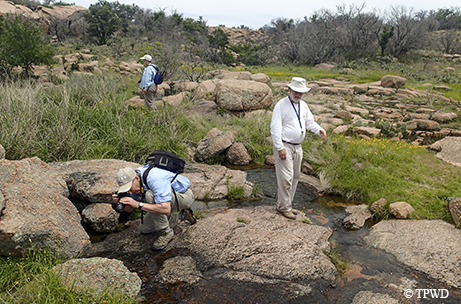 If you’ve ever explored Enchanted Rock, you’ve seen puddles in the granite called vernal pools. Inside these little magical microhabitats grows a grassy-looking plant called rock quillwort. One-quarter of the world’s population of this plant can be found on the Hill Country’s iconic pink domes. Plants in the quillwort family are most closely related to the spikemosses and clubmosses. Like ferns, these groups reproduce by spores and spore-bearing structures, called sporangia. Quillworts may have first appeared in the Jurassic Period, but they likely evolved from plants in the much earlier Devonian Period (the Age of Fish), some 420 million to 360 million years ago. These very early forms of quillworts were tree-like and were a major part of the plant matter in coal swamps, the ecosystem that later provided us with coal. The early appearance of quillwort likely resulted in its present worldwide distribution. By the Jurassic, the supercontinent Pangaea was starting to break apart into what would eventually become the seven continents we know today. It is likely that early quillwort was distributed throughout Pangaea. As landmasses broke away, each part of the larger mass retained a quillwort population. The quillwort we see today is much smaller than its coal-forming relatives. Most quillwort is confused with blades of grass or overlooked entirely. Their simple appearance consists of above-ground leaves with below-ground sporangia and roots. In fact, most of the identifying characteristics reside underground in the sporangia. Some plants require magnification to definitively identify them. Rock quillwort (Isoetes lithophila) is confined to those seasonal vernal pools of water on top of granite and gneiss outcrops in the Llano Uplift. The species name lithophila translates to “stone” (litho) “loving” (phil). Rock quillwort was first collected in Texas in 1914 and subsequently named in 1922. It is known from only about 10 populations in four counties in Texas, making it one of the rarer plants in the state. Although rock quillwort produces spores in the late winter and spring, it can also do so after heavy rainfall at other times of the year. The species is drought deciduous and dies back when the small pools of water dry up. When the plant is present, it is typically the most abundant one, so it’s likely not very tolerant of competition. Although little is known about its ability to disperse, other quillworts are thought to disperse by wind or water. Much is still to be learned about the biology of this plant. At this time, most of the work with rock quillwort involves searching for new populations and revisiting known populations. Hopefully, these efforts will help maintain this unassuming and tenacious plant for another few million years. Vernal pools contain several tiny water-dwelling species that, like rock quillwort, are generally absent from the drier surrounding landscape.